Based on the Royal Veterinary College’s (RVC) Hawkshead Estate in Hertfordshire, Boltons Park Farm has been an essential part of the RVC’s activities for over 45 years. We have 100 Holstein Friesian cows milking at the farm and a further 70 heifers which will join the herd as milking cows after their first calf at around two years old. For most of the year the herd grazes outside during the day and comes inside at night. Our 500 sheep are of mixed breeds and mostly graze all year in the fields adjacent to the Potters Bar golf club. 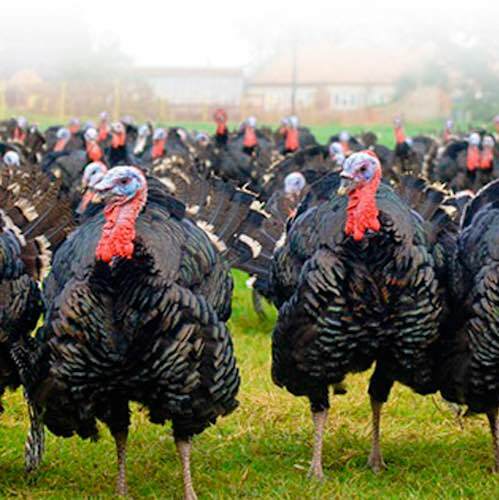 Our Norfolk Bronze and Black turkey flock are reared in environmentally enhanced conditions – the breed is ideal as it suits our rearing system well, is slow growing and produces a beautiful product. The farm is the RVC’s farm animal practical teaching facility. We host a wide range of student practical tasks and demonstrations. Our animals are very used to being handled and take it all in their stride! Last year students and visitors spent over 16,000 hours at Boltons Park. Year on year this figure increases.